I recently stumbled upon this week's Spotlight Mommy, while looking for cuff fasteners for myself. Thanks to my dad's side of the family, I am petite in size, with short legs -- meaning --- most of my pants either need to be hemmed to fit, or I have to roll them up, so I don't trip on them. It is hard to find petite pants at the stores. And, unfortunately I can rock capri pants, as they look like my pants shrunk. :-) What I am going through trying to find pants that fit and don't drag on the floor, Savannah and Arabella will have the same issues, as they also have short legs. :-( But, thanks Dani Schlesinger, creator of My Hikes Pant Cuff Fasteners, they will have any easier time come the fall when they are wearing long pants ago. Instead of having me try to hem their pants -- come on, if you are mom, you know the last thing you want to be doing is hemming baby and toddler pants -- I can use My Hike Pant Cuff Fasteners and viola, they will have pants that fit properly and will not drag. 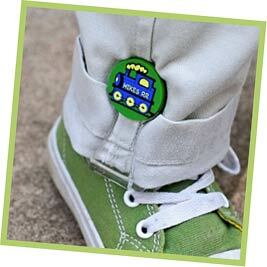 Just look at some of the cute pant cuff fasteners, Dani offers through her online store, for both boys and girls. 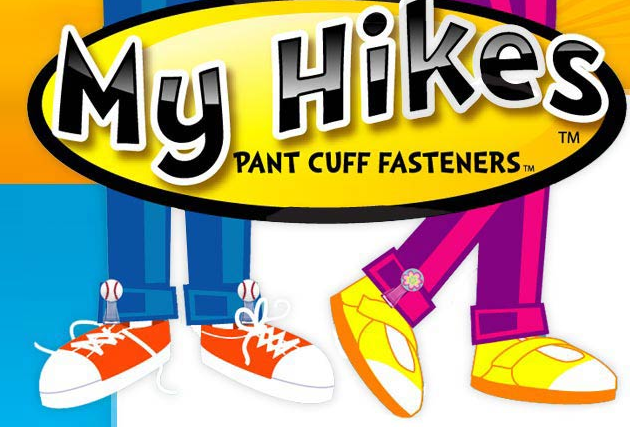 So, if your child is petite, or has short legs, and you are always finding yourself bending down to fold their pant legs up, you should definitely visit Dani's online store and pick up a pair or two of her My Hikes Pant cuff fasteners. 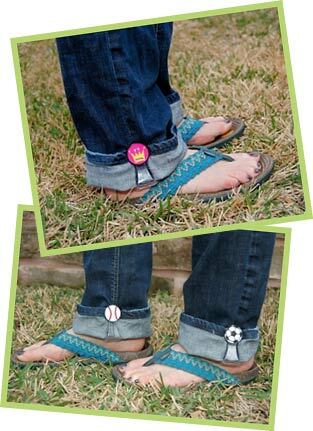 At only $19.99 for a pair of these fun and stylish cuff fasteners, you can't go wrong. 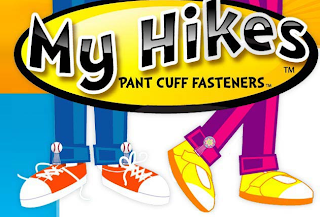 Head back here on Friday, when I will be offering a giveaway for one lucky reader to win a pair of My Hikes Pant Cuff Fasteners, thanks to Dani, along with a coupon code. But, in the meantime, please enjoy my Spotlight on Mommy interview with Dani. Age of Company: One year. Favorite Inspirational Quotes: My friend, Andy Ginster says this when people think going into business for yourself is too big of a risk “They’ll always be another cardboard cubicle. There is no shortage!” He believes, worse case, your business doesn’t work out and you go back to your cardboard cubicle. No big deal. He chuckles at people’s unwillingness to risk something no one likes that much anyway. His mentality and humor about this subject is inspiring to me. I have two kids, Henry (6) and Hannah (4). Raising my kids is the best, most fun and most difficult thing I’ve ever done, but they are well worth the effort. I absolutely treasure them! My hobbies include working on My Hikes, playing very amateur tennis and, as of late, learning to swim laps in a pool without huffing and puffing so much! I also love to go on dates with husband once in a while, where we can eat good food and drink a little wine. When I was working in real estate, I LOVED the job, but noticed that the more successful I became, the more nights and weekends I was working. Sometimes the nights and weekends would interfere with my family time and so I starting thinking to myself, “If I could just think of a widget to invent, I could work on that during the day and have evenings with my family.” A few months after opening my mind to looking for an idea, here’s what happened. When my son Henry was 2, I bought him some brand new jeans. When I first put them on they were too long, like is always the case with every new size. Of course, I rolled them up and walked away. And then I noticed that every time I turned around the rolled cuff had fallen down. Sometimes it was dragging the floor and other times it was getting underneath his socked feet causing him to slip. I thought there would be an easy solution for this, I figured I would just check the internet and find a cute kids pant-clip. I searched and searched and found NOTHING! I thought about it for a few days and decided to make one myself. I live in Austin, Texas which is a very casual place that loves physical fitness, so typically I wear work out clothes to work, even if I’m not actually going to the gym. It’s very easy to cheat on that here so I rarely even get dressed in business clothes! With My Hikes, I’ve had the most success with on-line companies either carrying the product or doing daily deals with me so I work with my computer and phone to contact companies and arrange deals. In the on-line realm, I also work with bloggers who always impress me with the great job they do getting the word out. Often they express their need for and usage of My Hikes better than I do! The biggest struggle has been to get the word out about My Hikes on a limited budget and figuring out how to best spend the money I have. In any entrepreneurial venture, you have to try things, some of them work and some of them don’t. The hard part is to be strategic and effective when to some degree you’re using trial and error to figure out success. My first career out of college, for 5 years, was to be a researcher and strategic planner for top 10 advertising agencies in Chicago. After that, for about 4 years, I worked as a Chicago real estate agent where I had more independence and fun, and learned the basics of building a business. As a Chicago real estate agent, I was once featured on HGTV’s House Hunters. the dominant force in accessories, so breaking into both the boy and girl markets means a lot to me. The hardest part was figuring out how to start the business. Early on, I thought I would be able to just call up brick and morter boutiques and easily sell them my product. With their businesses facing economic challenges and it being impossible to know if my product would fit their business from a phone list, my first plan turned out to be too much of an uphill battle. It makes a lot more sense to put the product on the internet everywhere I can and let the boutiques who want to sell it contact me. That’s how I work now. When My Hikes seems impossible, I think to myself that my day would be even “more impossible” to manage if I worked for someone other than myself and couldn’t at least control my schedule. If I’m struggling to keep up with My Hikes because I’m particularly busy, I just try to be grateful for the work because that’s what fuels the success of My Hikes. I think that the main secret is BABYSITTERS—I could not have gotten even this far without having some help that does not involve my husband. In more ways than I can count, I have a great husband, but with his high-stress job and the pressure he endures being main breadwinner, he doesn’t always have what it takes to step in and help me with the kids. Another important secret is MAKING YOUR KID TIME COUNT. When I’m with my kids, even if it’s not as much as I feel I should be, I try to do activities that are important to them and give them my full attention. My goals for My Hikes are to continue gaining awareness and growing sales. I will continue to grow my contacts in the retail world and hopefully grow My Hikes. I would also love to find a great promotional opportunity such as to be included in ABC’s Shark Tank or another show that would make strategic sense. I believe starting a business is something many women should do at least one time. It’s an awesome life experience and gives you a perspective and certain abilities that would help in any job down the road, even if the business you started eventually didn’t work out. That said, in my experience, timing when you start a business is really important. No matter what the business is, or what the business plan says, there are a lot of unknowns until you launch and struggle a bit. Whether it’s product development, learning the industry dynamics, training of employees, learning Quickbooks or some other key component, at least one or two things will usually take a lot longer to figure out than you expect. I thought it would take me one year to develop a salable product for My Hikes, it took three! SURPRISE! Be sure to take on this challenge at the right time, when you can afford the time off of a regular income and can sustain the risk some unexpected failures or strategic changes. It’s not an ideal thing to do when you’re under excessive financial pressure just to make ends meet. Last but not least, if you’re married, make sure you have a supportive husband, one way or another. By that I mean, either supportive in happily lending more assistance with the kids and clean-up than he ever has before. Or, perhaps just happy to fund some good babysitters and/or a cleaning person to help you care for your kids and home. As tough as we women are, doing EVERYTHING, would wear out anyone.